NEXT ARTICLEQuiz: Which Chicago Neighborhood Should You Live In? You’ve got places to go, people to see and posts to share on your various social medias. It’s a busy life! 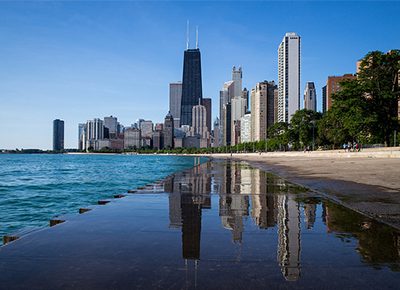 Luckily, Chicago’s home to an abundance of locations where you can do all three at once. Here, 18 places to explore and take some of the most picture-perfect photos the ‘gram has ever seen. Let’s just get this one out of the way now. There’s just no way not to take a photo when in the presence of The Bean. Give in to its power. Our favorite indie singers, comedians and more all look positively dreamy under Thalia Hall’s dimmed lights. Show off your cultured side and post a contemplative photo of you next to American Gothic. Or just post photos of your dog outside. That works too. Is there anything more iconic than the Wrigley sign? You’ve got to have at least one photo in front of its signature glow. Street artists from all over the world love to leave their mark in the gritty but upscale West Loop neighborhood. Put on your best fall look, pose in front of a mural and watch the likes roll in. Boasting some of the best views of the Chicago Skyline, the Adler Planetarium is the ultimate place to snap a shot during the magic hour. Every detail of the Palmer House is worthy of your Instagram feed, as far as we’re concerned. You’ll never stop discovering new angles here. Though the boats may get only three months a year of sailing time on Lake Michigan, they call Belmont Harbor home. The docked beauties, with their sails all lined in a row, is a sight worth sharing. Every square inch of Chinatown holds unexpected beauty. Go exploring with your camera (phone) after getting your fill of dim sum. Dull the pain of a 6 a.m. flight by snapping a photo of the beautiful archway at O’Hare. Shhh, we know the house rules, but we won’t tell anyone if you 'gram that muesli bowl at The Allis, located on Soho House’s ground floor. Sue is our city’s unofficial queen, and you owe it to her to post a photo of her slim physique for all the world to see. See all of downtown from below ground by traversing the Chicago Riverwalk, which runs from Lake Shore Drive to LaSalle Street. Our city’s amazing architecture looks extra magnificent from this angle. It can be easy to forget how pretty Buckingham Fountain is. Commit it to memory with a photo for yourself (and your many, many followers). Did we mention we love Chicago Athletic Association? We think you’ll love it just as much—just remember to look up from your camera phone every once in a while. This West Side greenhouse is Chicago’s best-kept secret. Lush with plant varieties from all over the world, there’s no better place to explore on a chilly fall afternoon. How often do you get to jump into a body of water with one of the best skylines in the world in the background? With the cool air coming, this is not for the faint of heart—but we know you can do it.